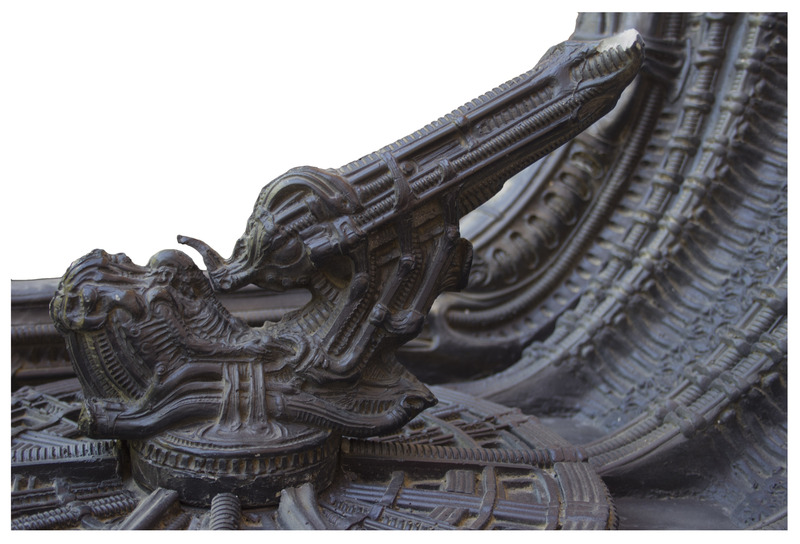 Scarce model from the 1979 film ''Alien'' of the famed ''Space Jockey'' character aboard the ''Derelict Spaceship'', designed and hand-painted by H.R. Giger. One of the most recognizable scenes in sci-fi cinema, the haunting Space Jockey aka The Pilot, found dead aboard the alien spaceship, was conceived and designed by famed Swiss surrealist painter, sculptor and visual effects artist H.R. Giger, whose work on ''Alien'' won an Academy Award in 1980. 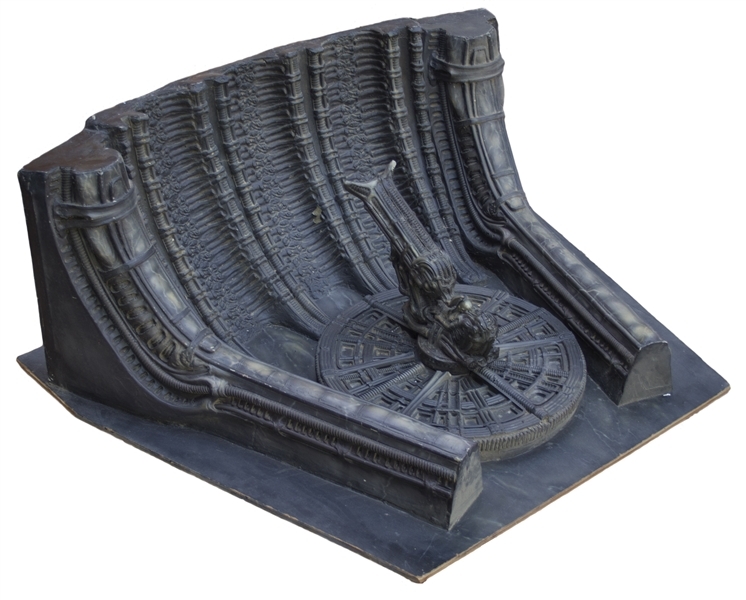 The enormous Space Jockey and cavernous spaceship are quintessential Giger, renowned for human-machine melded beings called biomechanoids; the walls of the spaceship appear to be either vertebrae from a once living creature, or cogs in a vast industrial machine system, or perhaps both. Space Jockey is fused into his command station and wears either a mask, or has an elephantine trunk extending from his face. In the ''Alien'' set -- which was built based on this model -- Space Jockey sits 26 feet tall, dwarfing the characters of Kane, Dallas and Lambert who find him dead, his rib cage blasted open, serving as foreshadowing to what awaits the crew later in the film. So pivotal was the scene -- establishing the world of the Alien creature and serving as ground zero for the film's mythology -- that Ridley Scott insisted upon its construction, despite the enormous cost of building the life-size (or larger than life) set. 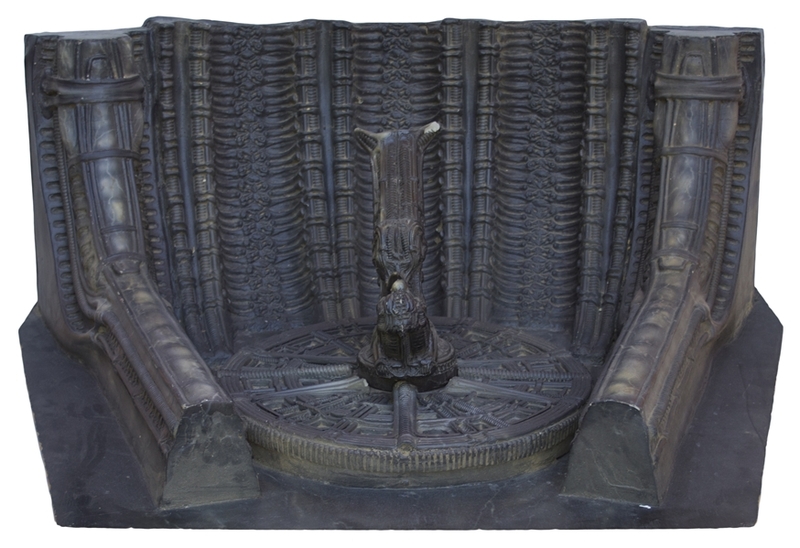 Space Jockey so enthralled the audience of ''Alien'', that the character would even go on to serve as a critical and central story point in Scott's ''Promethus'', the ''Alien'' origin story released in 2012. 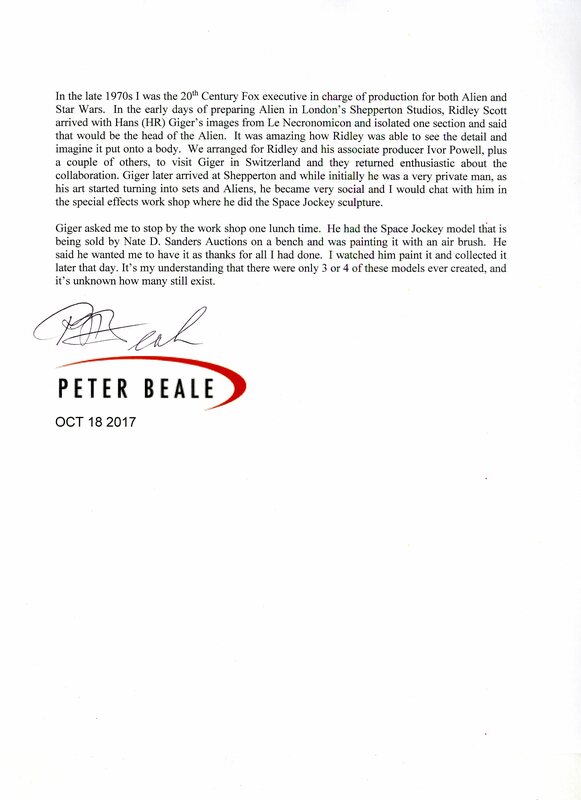 The model is reportedly one of only three or four known to exist and comes from the collection of Peter Beale, former 20th Century Fox executive who was given the model by Giger and whose LOA accompanies the piece. 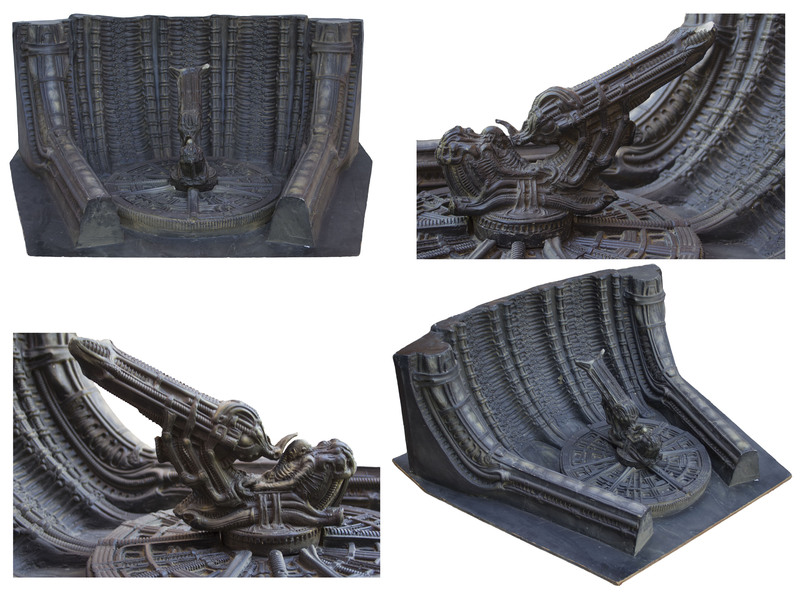 The original mold was intentionally cut into smaller parts to be used by the technicians who constructed the set, so the remaining models are the only extant original sculptures of the scene. 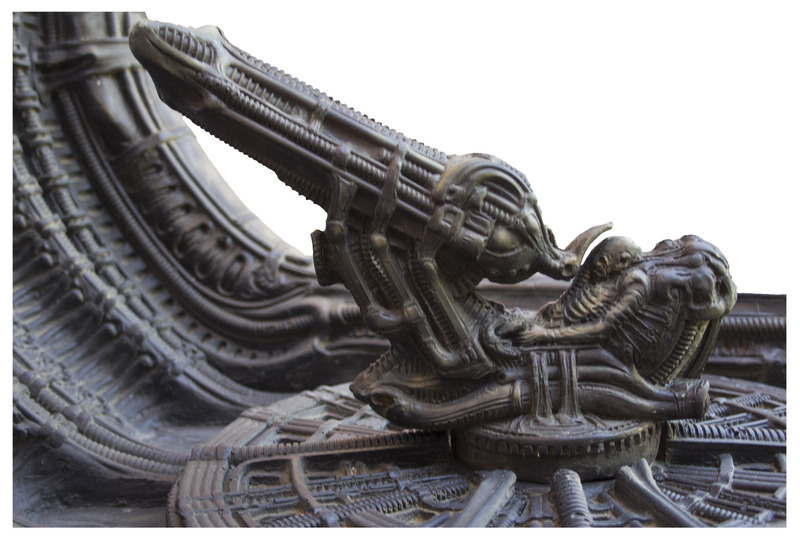 This model measures 43" wide x 36" long x 16.25" high, hand painted in tones of grey, brown and black by Giger. Space Jockey is fused into his pilot seat, which swivels around on a circular platform. The swiveling piece can be removed and measures 13.5" long x 10.25" high x 4.5" wide. Entire model weighs over 47 lbs., glued to a painted sheet of plywood. A few chips to the resin, otherwise in near fine condition. One of the finest "Alien" props ever to be sold at auction. 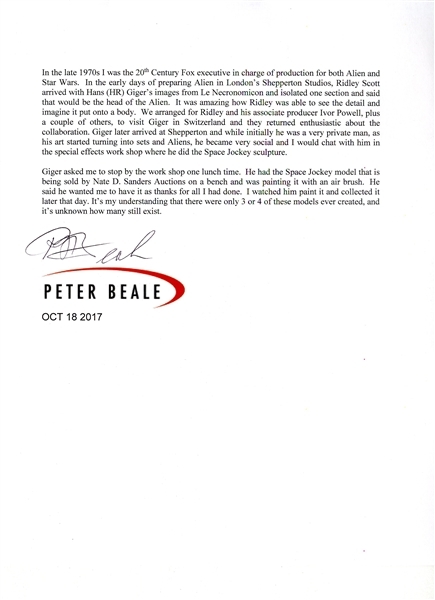 Auction closed on Thursday, October 26, 2017.